Well folks, the year is already half way over and we have successfully read and analyzed many a book! Okay... like four books. But still! Don't you feel so great! Here's what our Bon Book's Club schedule is looking like. 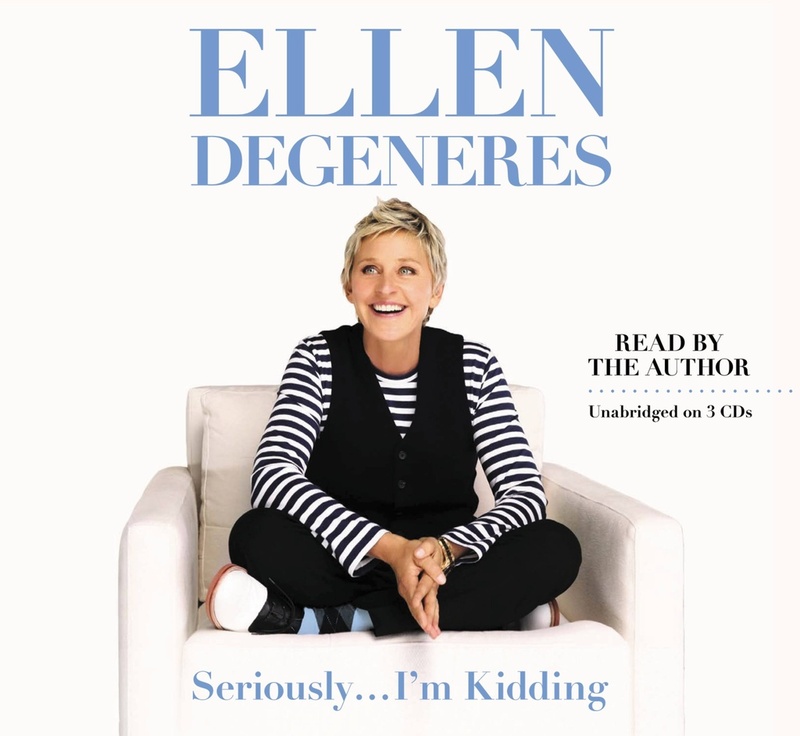 Today we're going to be discussing "Seriously, I'm Kidding" by Ellen Degeneres. We've got some great books coming up for the rest of the year, so make sure you keep on reading. I absolutely cannot wait to re-read The Help. It is one of my all time favorite books. But I'm getting ahead of myself! First we must discuss our June read! I was kind of on the fence with this book. I'm all about a fast read, but geez louise, this read was too fast! It took me all of an hour to down and when I've spent $16 buckaroos on a book I like it to at least last me through a day at the pool. + Ellen is hilarious. There were several parts where I laughed out loud. Or I starred the page and wrote "genuis" next to it. I decided while I was reading this that Ellen would make one heck of a blogger. The book almost felt more like a blog, actually, with short random chapters that give you a little snapshot of her life but mostly stays pretty superficial. + I think my favorite part of the book was when Ellen was talking about making a pro and con list to help us make decisions and she made a pro con list of making a pro con list. Absolutely brilliant. + Language is clean and content is appropriate. There was never a part where I felt squeamish. It's the type of book you would feel totally comfortable recommending to anyone in the world. +Very original thoughts. You know how sometimes you read a book or watch a movie and you've like, "Oh gosh I've seen this before, I've heard this before, she totally stole that from someone." This wasn't like that at all. It was like waves of new ideas and thoughts were coming at me full force. + In one chapter Ellen talks about how being considerate has totally gone out the window. Made me think I should double my efforts to be on time. Ellen doesn't like late people! When we were kids, all we wanted was to be older. When we were seven and a half and someone said we were only seven, we were furious. I don't know at what age people stop wanting to be older. People seem to enjoy their twenties and thirties. It must be around forty, when you're "over the hill." I don't even know what that means and why it's a bad thing. When I go hiking and I get over the hill, that means I'm past the hard part and there's a snack in my future. That's a good thing as far as I'm concerned. People seem to be shy about their age through their fifties and sixties, but then once they hit seventy or eighty, they start telling people again because it's such a huge victory to have made it that far. No one gets to one hundred and tells people they're only ninety-five. So I don't know why anyone has to lie about those middle years. We should celebrate every year that we made it through and every year that we're happier and healthier. Because honestly, that;s the best case scenario. And the bottom line is we are who we are- we look a certain way, we talk a certain way, we walk a certain way. When we learn to accept that, other people learn to accept us. So be who you really are. Embrace who you are. Literally. Hug yourself. Accept who you are. Unless you're a serial killer. - Sometimes it is hard to tell when Ellen is being serious and when she's kidding (hence, the title). Sometimes she would tell a story that is kind of crazy and I couldn't tell at all if had really happened or if she was just saying it to prove a point. For example, she is talking about how lazy our society has become and she tells a story about how one day she came home from work and wanted to pet her cat. Instead of looking for him, she paged him on the intercom. I couldn't tell if this had really happened or if she was just trying to show how ridiculous we all are. - I wanted to know more details of her life. I get that this was not the purpose of the book, but I kept wanting her to go deeper. I especially wanted to know what it was like to be such a big public figure and come out. She talked about her tv show being cancelled when she announced she was gay, but she gave no specifics and even there I couldn't tell if she was making a joke or being serious. - There's no actual story line so it's easy to lose focus. I kind of zoned and then would come back in but it's like I didn't really miss anything. I think generally I enjoy a story where everything builds on something else and the story is actually building to a point. Definitely none of that here. - Sometimes she goes off on too many tangents. And it's hard to follow. There's this chapter called "Beach Chapter" and it felt just like some random blogger's rant. I'm usually not impressed when I read something and thing, "I can and have written way better than that." That being said, I only felt this way at times in the book, at other times I was extremely impressed. July's book club discussion will be held on Wednesday, July 31 and we will be discussing "The Help." I went to the store to buy this book, couldn't find it (at Target) and bought Tina Fey's book instead. Now want to read Ellen's! Which, I already did before so. . . I'll go try harder to find it. You definitely made me want to read this! I love Ellen, she's hilarious! This is on my "to read" list. Sometimes you just need a light hearted read. I completely agree - I was hoping the book would have more about her personal life in it. Not the silly little stories, but the bigger stuff. Have you read Portia's book? I mean, these 2 books could not have been more different - I guess I was looking for something a little more in the middle from Ellen's book. That being said, when I read this book, I actually wrote down some of the age quote that you mentioned. Ellen has a really great grasp on making the most of your life, every single day. I liked the book overall, and I'm glad I was able to get it from the library because I completely agree - if I'm going to pay for a book, I want it to last for at least a couple days. Sigh... I totally forgot. By the time I remembered I knew it would be too late for me to read in time for the book club. I'M SORRY! But, in my defense, I just downloaded The Help from my library onto my iPad. So I'm WAY ahead of the curve for July! lol. I'm going to see if I can find this one too though because I have been meaning to read it. love Ellen, i have been wanting to read this book for a while now :) thanks for such a great review! It made me happy. :) three people I work with have read it since...I laughed a lot at work and it made them want to read it! You should get the rest on amazon. Most of the books for book club were under $10 and the most for one was $12 I think. I definitely want to read this book! I haven't read in such a long time and I think this would be a great one. I read one of them recently, it is a good getaway but so much like her show. You don't get anything more. Worth the read. If I was into audio books I think these will be fantastic also.